The newest addition to Hingham, a town on Boston's South Shore, is the Brio -- a gorgeous luxury water-front luxury condo complex. Situated in Hingham Shipyard, it doesn't take long to get there from the big city, either. Hop on a quick ferry ride from Downtown Boston and you're there in minutes, or drive. Your choice. With 75 units and a combo of one and two bedroom residences, you get unparalleled water and marina views every single day. With pricing starting at $500,000, units are sized between 750 and 2,100 square feet. The Town of Hingham is located just 15 miles south of Boston, featuring a rich history evident in its quaint antique houses and old-town atmosphere. From the Hingham Historical Society Museum to Derby Academy to the First Parish Old Ship Church, Hingham is home to six historic districts. Located in Plymouth County, Hingham boasts 21 miles of shoreline and its newly-expanded Hingham Harbor park. This historic seaside community offers many recreational opportunities for residents, such as Bare Cove Park with 500 acres of biking and walking trails along Back River, World's End. This 250-acre peninsula provides fantastic views of Hingham Harbor as well as the Boston skyline. You can even go camping at Wompatuck State park, featuring 3,000 acres of woodland home to the biggest public campground in metro Boston. As a resident of the Brio, you'd be close to The Launch at Hingham Shipyard featuring a multitude of retail shops, restaurants, pizzerias, a paint bar, Pilates and barre studios, movie theaters, markets, hair salons, fitness centers, and other service-based businesses. There's even a bocce court! 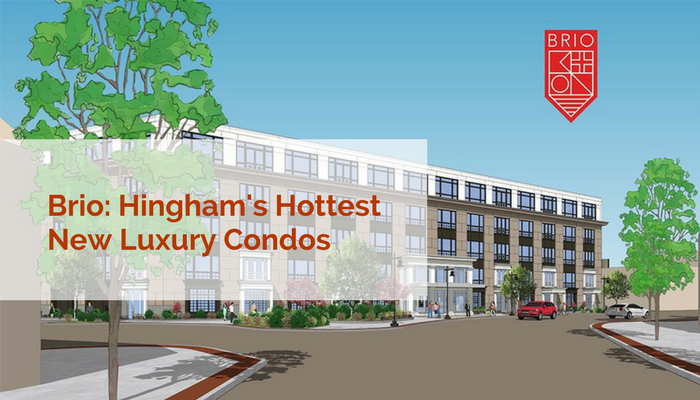 Located in the heart of the Hingham Shipyard, the Brio will be a welcome addition to the area and serve as a stepping stone for other similar Hingham luxury condos. The Brio has started pre-sales, so contact Elevated Realty today at info@elevatedboston.com or 617-701-6300 so you don't miss your chance. We would be happy to give you more information and book your appointment.